This article was written by Steve Smiley, Associate Head Coach, University of Northern Colorado. Fellow Coaches – I’m really excited to dive into today’s topic. I think regardless of the time of year that you’re reading this article; it’s imperative to think about how you and your staff handle the game-day experience in terms of preparing for games, managing the actual game, and then digesting the information from the game after it’s over. I genuinely believe that the best programs have a system for all phases of the “Game Management Cycle.” These programs are able to stick to a consistent plan and structure regardless of the outcome of each game. They are also the programs that will play their best basketball at the end of the season when it matters the most! In preparation for the game, the idea of scouting really comes into play, and coaches at all levels have a wide range of beliefs on scouting. Programs at one end of the spectrum spend multiple days and practices on an opponent. Others at the opposite end, believe that the entire focus should be on their own team and that they don’t need to spend much time at all on the opponent. At UNC and the other previous winning programs that I’ve been a part of (Weber State, Sheridan JC, Northern State University, etc. ), our ratio was about 80:20. This means that in the days leading up to the next game, 80% of our time and energy was devoted to self, but around 20% of the time in practice and film-work was devoted to the scouting of the opponent. I genuinely believe that a distinct advantage is possible by properly scouting the opponent. Studying their key tendencies on both sides of the ball, as well as their personnel will provide this advantage. To me, the only teams that can spend 100% of their time on self are the teams that have such elite talent/size/athleticism on their roster that they can overpower an opponent on game day. Or, they run a system of play (press to zone for example) that isn’t as focused on what the opponent does. With the basketball tools and resources available to coaches today (at our level we use Synergy, KenPom, basic stats, sharing of ideas with other teams that play our common opponents), there is no reason or excuse not to study an opponent so that you can do your best to take away strengths and expose weaknesses. Coach Linder, our Head Coach, spends a ton of time watching film and he will always have a plan for how we’re going to attack their defense. This may include how we’re going to attack their ball/screen coverage, which switches we’re going to try and create for our advantage, how to attack their zone, etc. Our Lead Scout for a game will prepare all of this information (while discussing schemes with Coach Linder), and each one of our assistants uses a slightly different method to get it done. I prefer to use a 1-page template that helps me cover all of the areas that I want to touch on. ***The amount of time that the Assistant/Lead Scout puts into each scout for our staff equals upwards of 40 hours of work. The key to scouting, in my opinion, is deciding what to show your players, as well as what NOT to show your players. Two Days Before the Game - This is usually a minimal amount of time, and sometimes we don’t do anything for the opponent two days in advance. However, we may go over a few key concepts or ideas on the court. Some of these include, what the other team may do in transition, how we might guard a high-level post player, and possibly a few breakdown basketball drills on their main offensive attack. ***After practice is over; we like to watch around 10-12 minutes of live action from the opponent’s most recent game. We believe this helps our players before we dive into the opponent at practice the next day. Our Head Coach and our Lead Scout for the opponent will stop the film and point out ideas on both system and personnel, which makes us much more efficient the following day. During practice, we will sprinkle in the above actions throughout practice, but never do them all together. For example, we might start with an opponent's BLOBs, and then dummy some of our Sets. After that, we will shoot before going into their ball-screen actions and then more shooting before doing an opponent's 3pt plays. We don’t want to spend too much time at once on the opponent, just small pieces of their game-plan sprinkled throughout practice. After practice, we will head straight into the film room to watch the personnel edit and hand out the personnel paperwork. It will take us between 20-30 minutes to go through the film edit with our guys. Game-day Practice/Shoot-Around - There are a variety of different items that must be covered on a game day before tip-off occurs. The first thing that happens on the court for us would be a 40-60 min (max) practice. This is going to happen roughly 5 hours before tip-off. So if we play at 7:00, we practice at 2:00. That way our guys can eat a pre-game meal at 3:00, 4 hours before tip. And, while the practice the day before a game will have live, competitive sections in it (we’ll be fully taped/braced/padded the day before), we typically don’t go live on game-day. The goal of the game-day practice for us is to review the key concepts from the day before (for both our attack and for the opponent), and also to get up a lot of shots. *** We also may have guys come in throughout out the day (especially if we’re playing at home), and get extra individual work with their position coach for a max of 30 minutes. Personnel Board - Our players will typically arrive between 120-90 minutes before tip-off (and will be on the floor at least 60 minutes before tip). As players are getting ready in the locker room, one whiteboard will be filled with information from the Lead Scout Assistant for that game. It will cover the other team's personnel broken down by #, Name, Player/Sniper/Driver, and Position. On another board, Coach Linder will eventually put his keys and ideas down for his talks during warm-ups. We try to keep those boards simple and to the point. This will prevent players from getting overloaded with information. Only the most pertinent information will be on the board. Player Warm-Up - As mentioned above, our players will all need to be on the court with 60:00 minutes left on the clock. For the next 10 minutes, they will free shoot, dribble, or get loose. At the 50:00-minute mark, our athletic trainer, will lead the team through a 3-minute dynamic stretch. At the 47:00 mark, our post coach (Ken DeWeese) has 4 minutes to work with our post players on finishes, while the guards do more stretching with the athletic trainer. At 43:00, we flip the posts and the guards, and the guards now have 4 minutes to work with myself and Coach Vinnie McGhee on our Drive To Basket (DTB) Finishing Sequence. From 39:00 to 36:00, our guys come together for 2-line layups, and then after that, we head back into the locker-room. Coach Linder and the staff meet the guys at about 31:00, and Coach Linder will then review personnel and talk about his key points to the game until approximately 24:00 when we send our guys back on the court. The team will go straight into 2-line lay-ups for no more than 2 minutes. From 22:00 to 18:00, Coach DeWeese will work with the posts again on another finishing sequence, while Coach McGhee will run our guards through our various dribble sequences. The two groups flip at the 18:00 mark, and from 18:00 to 14:00, the guards will go through our Game Shots Progression (both Spot Shots and Movement Shots). From 14:00 to 10:00, we bring the entire group together to do a sequence of finishing and shooting, and then we go back into the locker room one more time. At the 7:00 mark, Coach Linder talks to the guys briefly again, before we head back out with about 3:00 left. This is one of the areas that coaches ask me about all the time, in regards to what we chart during the game. Obviously, the size of the staff is different at every level, so coaches need to prioritize what is essential to them depending upon how many assistants they have available to chart during a game. Basics = Fouls & Timeouts - Our Director of Basketball Operations (DOBO), Taylor Green, is in charge of these basic but absolutely crucial, items. Opponent Play Calls - The Lead Scout will try to follow the calls, and with the help of our DOBO, those calls will always be written down for future reference in the current game and for later in the season. Substitutions - This has been my job at UNC, and also previously at Weber. I’m always holding a medium-sized whiteboard with the current 5v5 matchups on it. It’s absolutely crucial to have your players matched up correctly with no confusion. “Kills” - Another one of our Assistants tracks this stat. A “KILL” for us is three defensive stops in a row. It’s one of the trackable goals that we have for our team. At half-time, we always discuss how many kills that we currently have (our goal is four kills per half). Paint Touches - We like to chart how many of our shots came as the result of paint touches (for example, we had 13 paint touches that resulted in 21 shots). Game Day/Play Call Sheet - Coach Linder always creates his personalized play call sheet and has it handy at all times. He refers to his sheet mainly during Time-outs and dead-ball situations. Who to Foul/Etc. - The Lead Scout must know who to foul, and who not to foul if the game gets late, and we have to foul to extend the game. Coaches Meeting – As soon as we get back into the coach’s locker room at halftime (15 minutes is our timing), we have 3-5 minutes to digest the information from the box score, our charts (Kills & Paint Touches), and what we saw on the floor. It’s vitally important that we use our time efficiently and decide the main things that we need to discuss with our guys, including any adjustments, before the start of the second half. Meeting with Players – Our staff will get into the player locker room with about 10 minutes left and have no more than 5 minutes to talk to the team. We quickly review how many Kills, other basic stats (how many 3’s we’ve given up, for example), gather any player ideas, and then we’re right back on the court to loosen up for the final 5 minutes before the 2nd half begins. There are three primary sources of statistical information that we review after the game. The first is the basic game box score, which still holds plenty of value in today’s game. We can gather information quickly from that one sheet of information about how the game was played on both a team and an individual player level. The second source would be the updated cumulative season stats (both overall and conference-only). Our sports information director will email us the updates that same night, and we can look at how that game affected our players and the team on their season box scores. The last piece of statistical data that we’ll review after a game would be our updated KenPom sheet. We subscribe to kenpom.com, and we really believe in the advanced stats that KenPom provides (almost immediately after a game). For the past five years that I’ve been an assistant coach at the D1 level, I’ve always been a big fan of learning the intricacies of KenPom. We’ve actually built a lot of our system based on the areas that we want to be elite at based upon KenPom’s rating system. All of our coaches (Head Coach, 3 Assistants, DOBO, and Assistant DOBO) get immediate access to the game film on our laptops after the game. At this point, we all have separate jobs in terms of cutting and grading the film to share with our team the next day. Defensive Shot Chart/PPP - This is my job. I tally each shot that the opponent takes in a specific category and whether they scored 1,2, or 3 points on those shots. After grading the film, I can tell exactly how the opponent got their shots (were we able to force the opponent into the shots we want them to take or did they get the shots that they wanted?). Also, I can see the Points Per Possession (PPP) value of each of those categories. We have a database that we add to after each game, and after three years of data, we have an excellent understanding of what shots we want and don’t want the opponent taking. Offensive Shot Chart/PPP - Our DOBO, Taylor Green, is in charge of this, and it is the same chart that I use, except he grades out our shots, not the opponents. This is mainly shared with Coach Linder as he reviews the offensive production from each game. Defensive Rebound Grading - Coach DeWeese grades out each shot on the defensive end in terms of our rebounding coverage. He will give every player a grade on each shot that goes up (plus or minus). At the end of the game, the goal for each player, and our team as a whole is to have a rebounding effort of 80% or better. To get a plus, the player must do his job on the shot. Players may have different rebounding responsibilities based on where they are at on the floor. So it is important that they are graded on their specific responsibility for each shot. Offensive Rebound Grading - Coach McGhee does the same grading for each shot that we take on offense. Players will get a plus or minus on each shot, and to get a plus, the players must do their job. “Crash” Guys have to crash and get to at least 50-50, “Get-Back” Guys have to sprint to at least half-court on the release of the shot, etc. The goal is once again to be at 80% individually, and 80% as a team. ***Role of the Assistant DOBO = immediately cutting the game into offensive possessions and defensive possessions. Coach Linder prefers to watch all of the offensive clips at once, and all of the defensive clips at once. The final piece of wrapping up the previous game usually has to do with film review. For the team, if we have enough time in between games, we will make an edit with different categories (Coach Linder always prepares the offense, and then we as the assistants would prepare Good D/Bad D/Rebounding Effort/Winning Plays/Losing Plays, etc.). For individual players, each Assistant has 3-4 players that they’re in charge of for extra film work and skill work (at UNC, we split it up with Guards, Wings, Posts). My group is the wings, so in terms of cutting the film, I make edits (we use Sports-Code) for each one of my guys after the game based on their individual clips (depending upon how much they play, this will usually be between 20-40 clips per game). The following day, those players will get some quick film work in with me during the day (preferably before our next practice). We can digest a lot of personalized film in around 30 minutes. In our program, it’s an absolute non-negotiable that our assistants have film ready for our guys after games. Throughout the season, our player’s IQ’s continue to improve, our mistakes decrease, and we usually are playing our best basketball in March because of this! It is crucial to have a system in play to attack all phases of the Game Management Cycle. Each level has different challenges with staff size, technology, other duties, and limited time. I remember being an Athletic Director at two different campuses while coaching at Sheridan College, so I get it! I believe though that all coaches must take the time to analyze how to prepare their teams best before the game, help their team during the game, and then (possibly most importantly) review and analyze the game with their players to get closure and to spring forward. The programs that can find ways to best grasp the Game Management Cycle will typically be the ones that are the most consistent and get the most out of each team! 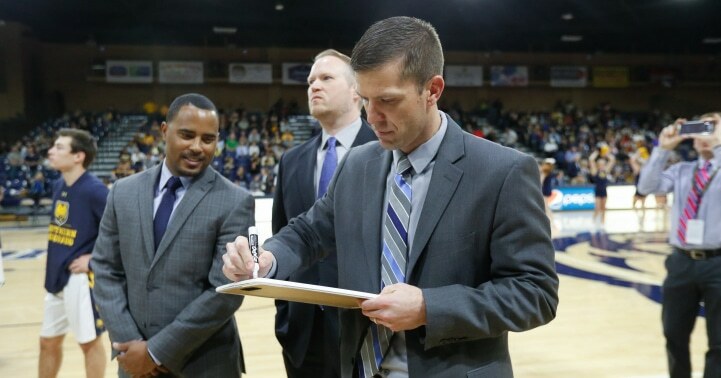 For more information or if you have questions, feel free to email me at stevesmiley0522@yahoo.com or reach out to me on Twitter (@coach_smiley), and if you enjoyed this article, feel free to check out my previous work on BasketballHQ, The 5 Defensive 5’s of Northern Colorado Basketball.